A standardized packaging format for modular applications, allowing deployment into any eXist-db instance. 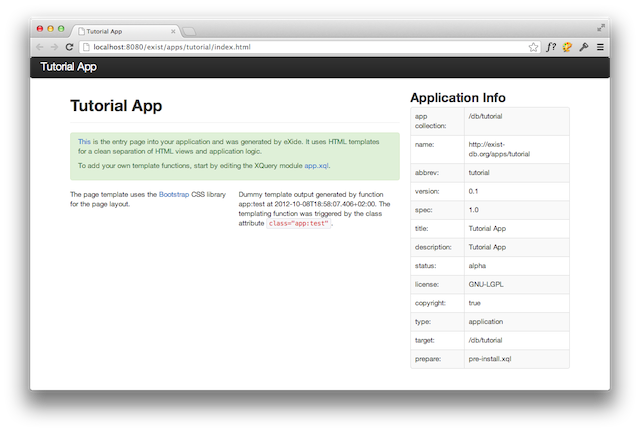 A set of tools to create application packages, integrated into our XQuery IDE, eXide. An HTML templating framework for a clean separation of HTML page content and application logic. A tight integration with XForms for fast form development. A clean approach for the deployment of RESTful services based on XQuery code annotations (RESTXQ). Those working on data sets in TEI may want to look at TEI Publisher also. It includes an application generator tailored at digital editions. The created app packages include all the basic functionality needed for browsing the edition, searching it or producing PDFs and ePUBs. eXist-db builds on the concept of self-contained, modular applications using a standardized packaging format. Applications live inside the database, so application code, HTML views, associated services and data all reside in the same place. This allows packaging an application and pass it to someone else for installation in another database. It might even be published to eXist-db's public repository. The packaging format is compliant with the EXPath packaging proposal, though it extends it considerably. For distribution, an application is packed into a .xar archive, which is basically a ZIP archive. The .xar archive contains all the application code and optionally data. The documentation, the dashboard, eXide and the eXist XQuery Features Demo are all examples of these application packages. The packaging format includes descriptor files. These describe the application and control the installation process. As an absolute minimum, an application package must contain two descriptor files: expath-pkg.xml and repo.xml. You can read more about these files in the package repository documentation. Detailed knowledge about these files is not required for the following sections: eXide will create the proper basic descriptors for you automatically. To start a new application, open eXide by clicking the link or by going via the dashboard or the system tray menu of eXist-db. Fill out the form by choosing a template, a target collection, a name, an abbreviation and a title for the application (see below). All other form fields and pages are optional, so you can ignore them for now. The "eXist-db Design" template is based on the standard eXist-db page layout and design. The "Plain" template creates a basic page layout without eXist-db specific stuff. The "Empty Package" creates an empty package with just the descriptors in it. Both the "eXist-db Design" and "Plain" templates use the Bootstrap CSS library for styling and the HTML templating XQuery module to achieve a clean separation of concerns. More about this later. The main distinction between "library" and "application" is: a "library" does not have an HTML view and will therefore not show a clickable icon in the dashboard. If you want to create a library, use the "Empty Package" template. This is the collection where your app will be installed by default. Please note that this can be changed by the package manager during install. It is a recommendation, not a requirement. A unique identifier for the application. The EXPath proposal recommends to use a URI here to avoid name collisions so we have made this is a requirement. A short abbreviation for the application. Among other things, it will be used as the file name of the final .xar package and for the name of the collection into which the application installs. Choose a simple abbreviation without spaces or punctuation characters. A short description of the application, which will be displayed to the user in the dashboard. Click on Done when you have completed the form. eXide will now generate a collection hierarchy for the application based on the template selected. Once completed, the Open Document dialog will pop up to indicate that you can start editing files. In the following, we assume that the app has been called "Tutorial" and its abbreviation is "tutorial". To test if the application has been generated properly, select the index.html page of the new app in the open dialog and load it into eXide. With index.html open, select Application, Run App from the menu. 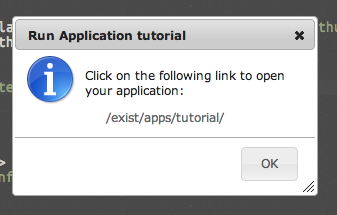 A small dialog box will pop up, showing you a link to the application. Click on the link to run the application in a separate browser tab. All the items in the Application menu apply to the active app (the application to which the file currently open in the editor belongs). You can check which app is active by looking at the Current app: status label at the top right of the eXide window. eXide has created an application skeleton for you which works out of the box. 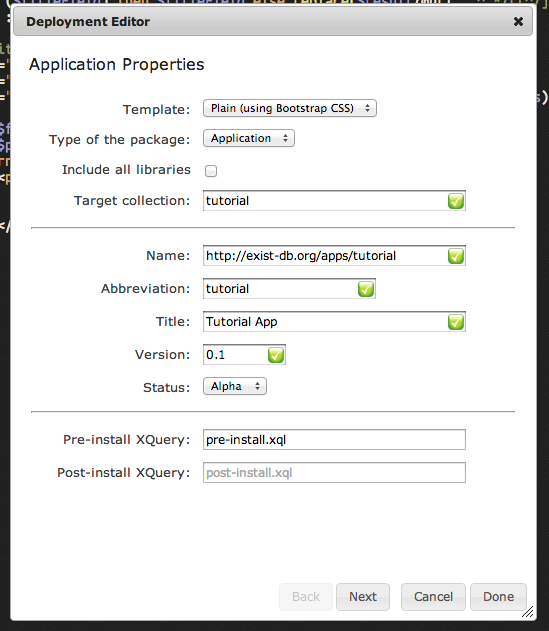 All resources of the application reside below the target collection (/db/tutorial). Contains XQuery modules. The actual application code should go here. Page templates containing all the repeating parts of the site's HTML layout. A template file for the index configuration for this application. This file will be copied into the correct system collection when the application is installed. This causes automatic indexing of installed data. The URL rewriting controller, which handles the URL handling of the application. You will rarely need to change this for simple applications. Package descriptor files for the application. These contain the information you entered via the Deployment Editor. You don't need to edit these files directly. Instead, open the Deployment Editor to change any of the descriptor properties. The default start page of the application. An XQuery script run by the package manager before installing the app. By default, the script only ensures the index configurations (in collection.xconf) is properly copied to the corresponding system collection. In addition to pre-install.xql, you may also define a post-install.xql script via the Deployment Editor. As the name says, this script will run after the app is deployed into the database. It is most often used to copy resources or run initialization tasks. You are not required to keep this structure. Feel free to restructure the app as you like it and remove some of its parts. However, preserve the two descriptor files expath-pkg.xml and repo.xml. 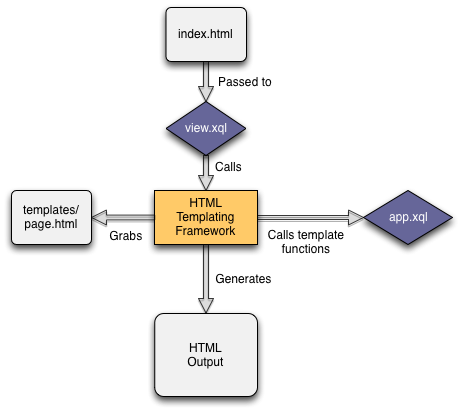 The generated application code uses the HTML Templating Framework to connect HTML views with the application logic. The goal of the HTML Templating Framework is a clean separation of concerns. If you look at the index.html page, you'll see it is just an HTML div defining the actual content body. The rest of the page is dragged in from the page template residing in templates/page.html. The input for the templating is always a plain HTML file. The module scans the HTML view for elements with class attributes, following a simple convention: It tries to translate the class attributes into XQuery function calls. By using class attributes, the HTML remains sufficiently clean and does not get messed up with application code. A web designer could take the HTML files and work on them without being bothered by this. templates:surround is one of the default templating functions provided by the module. It loads templates/page.html and inserts the current div from index.html into the element with the id content in templates/page.html. A detailed description of templates:surround can be found in the HTML templating module documentation. Add your own templating functions to the XQuery module modules/app.xql. 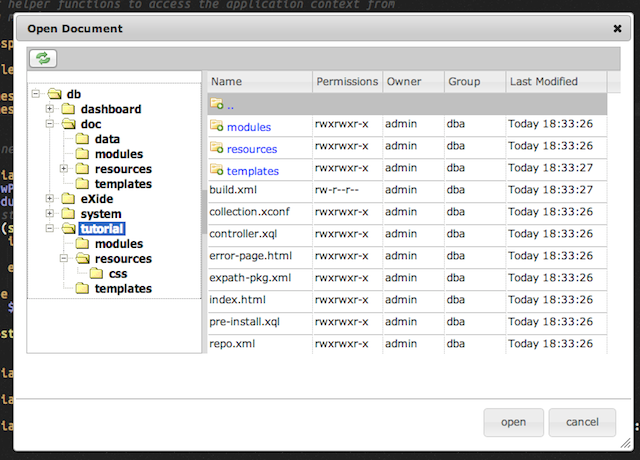 Or add your own modules by importing them in modules/view.xql). This creates a simple form and a paragraph connected to the template function app:helloworld through its class attribute. Save the HTML view to the root collection of your application as /db/apps/tutorial/hello.html. A template function is a normal XQuery function with two required parameters: $node and $model. Additional parameters are allowed (see below). $node is the HTML element currently being processed, in our example case a <p> element. $model is an XQuery map containing application data. We can ignore both parameters for this simple example, but they must be present or the function won't be recognized by the templating module. Please refer to the HTML templating documentation for more information. The third parameter, $name, is injected automatically by the templating framework. The templating library will try to make a best guess about how to fill in any additional parameters. In this case, an HTTP request parameter called name will be passed in when the form is submitted. The parameter name matches the name of the variable, so the templating framework will try to use it and the function parameter will be set to the value of this request parameter. Fill out the box with a name and press return. Once you have created the first pages of an application, it is a good idea to export it to a folder on disk. 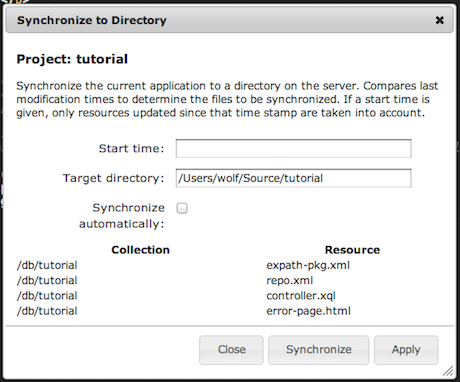 One way to do this is choose Application, Download from the menu to create a .xar archive of the application. You can however also export the app to the file system which has the advantage that you can continue working on the app and have eXide keep track of which files were modified since the last export. With a copy on the file system you can also add it to a version control system like GIT or SVN. If you are accessing eXist-db on a server, not the machine you are opening eXide in, this must point to a directory on the server running eXist-db, not your local file system. If you are running eXist from your own machine use this. The Start time can be ignored for now. It will show the date/time of your last export when you synchronize again. Clicking on Synchronize starts the export. The names of the resources written show up in the table at the bottom of the dialog.